I often have the urge to bake when the weather is gloomy or cold. I guess it’s like nesting or storing up carbs for a self-imposed hibernation? That isn’t the case with baking bread. We love home baked bread. It tastes so much better than store-bought, and I started baking more bread when I had a loaf of store-bought that never molded. I have a real problem with preservatives. I don’t think that they can be good for us. I wish it worked as a preservative for youth but it seems to do the opposite. I used to participate in baking challenges that issued monthly challenges to its members. I liked the vast experience of the group and it forced me out of my comfort zone. Members were from all over the world so the challenges were often for things I’d never made and sometimes never heard of. The challenge that inspired this recipe was Italian inspired bread. I had to try Focaccia. Focaccia is a type of flat Italian bread. The term focaccia is derived from the latin Panis focacius which means bread that is baked in the ashes. 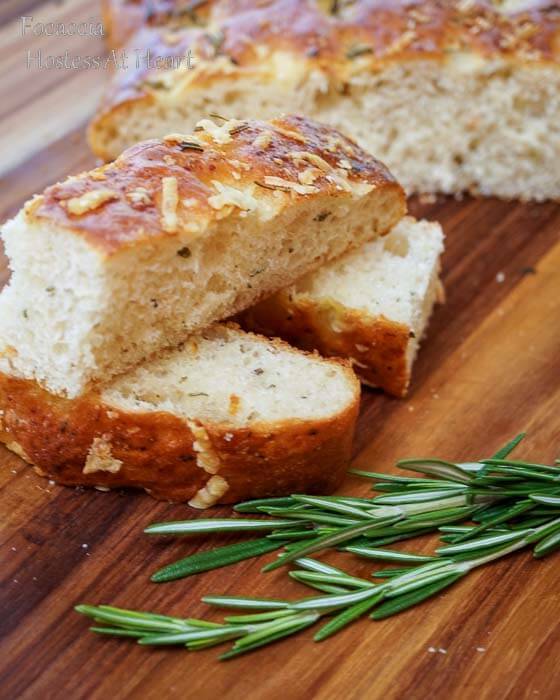 Focaccia can be topped with a variety of toppings ranging from rosemary and sea salt to different types of cheese, herbs, vegetables, and even fruit. I love focaccia and have made it several times. The thing I like about this bread is that it makes a great addition to a meal but I love serving it as an appetizer with a cheese and fruit plate. 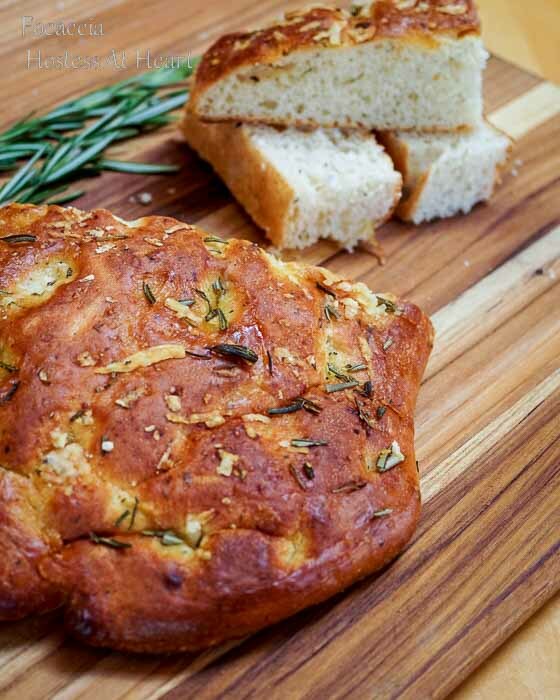 There are so many variations to focaccia, but I love the traditional version with rosemary and Parmigiano Reggiano. I didn’t make any changes to the recipe that was originally featured on allRecipes.com. Traditional Focaccia is a great bread that can stand alone or goes great with a meat and cheese tray or a big bowl of pasta. In a large bowl, stir together the flour, salt, garlic powder, oregano, thyme, basil, and black pepper. Mix in the vegetable oil and then add the milk-yeast mixture. Stir with a wooden spoon until the dough has pulled together, turn it out onto a lightly floured surface and knead until smooth and elastic, about 10 minutes. Place the dough in a lightly oiled large bowl, turning once to coat both sides. Cover with a damp cloth and let rise until it doubles in size (1 to 1-1/2 hours). Punch down dough and place on a well greased rimmed baking sheet. Pat into a 1/2 inch thick rectangle or any shape to your liking. To give the dough the dimples effect, use your fingertips, pushing gently all over the surface of the dough. Brush generously with olive oil. Sprinkle with cheese, rosemary and kosher or sea salt. Allow dough to rest for 10 to 15 minutes. Bake for 15 minutes or until golden brown in a preheated 450 degree F oven with the rack set to the middle position. Prep time includes non-active raising time. Here are a few of my favorite bread recipes. These groups really helped inspire my love for bread baking. Are you a bread baker? 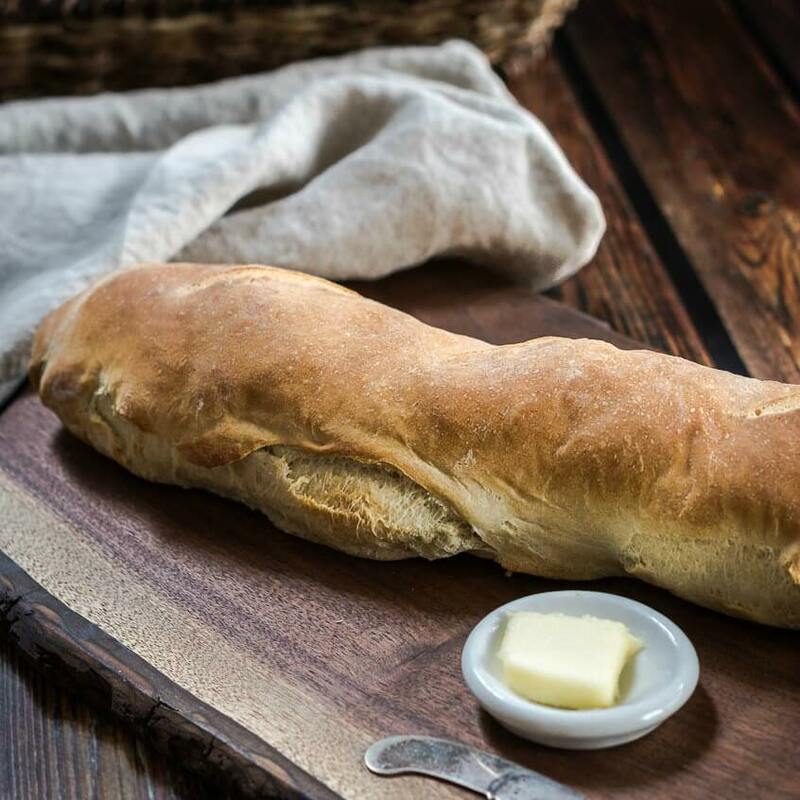 What is your favorite go-to bread recipe? I would love to try this recipe! 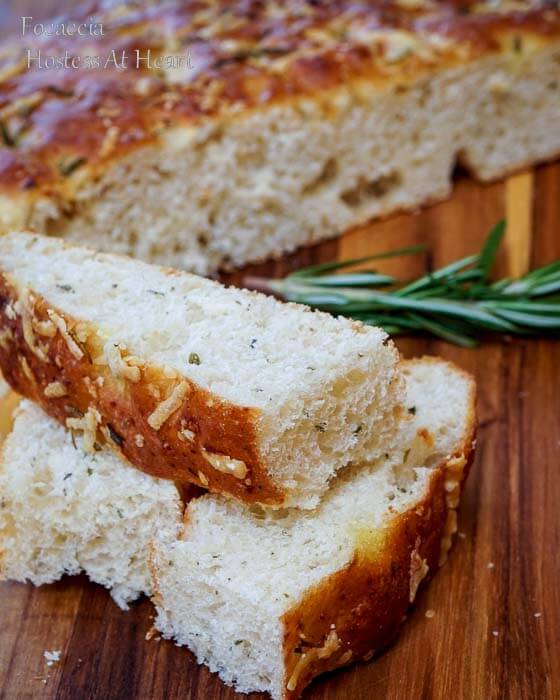 Focaccia is such a delicious bread and a family-favorite! Easy peasy Anna! It is delicious and I’ve even taken it as an appetizer with olive oil and parm dipping sauce. If you try it let me know how it turns out or let me know if you have any questions. Oh Anna, I just made some a couple weeks ago. I have a recipe that my husbands grandmother brought from Italy. I made ravioli that my Father-in-law had as a child. He’s 91 now so I can only imagine how old it is! He just loved that I made it for him. Oh Julie, that sounds so wonderful!! And how special that it’s a family recipe from Italy! Wow, that sounds amazing!! Thank you Anna! I loved doing it too. Thank you Loretta, you are such a sweetie! Baking is definitely something I enjoy! I’ll have to get a sign declaring my title and post it in my kitchen! It’s probably the easiest bread to make. So forgiving and very versatile. I would love to take classes like that but there isn’t much offered around here. I can almost smell this delicious bread. You make everything looks so easy. Thank you Tracey! I love baking bread and want to try some more artisan recipes. That is where it gets difficult! Julie this looks divine! I used to live in Florence (hence my similarly Italian recipe at Fiesta Friday) and I loved that you could get fresh foccaccia on every corner there. I ate far too much of it! I have never once tried to make my own though, which is crazy! You have given me the push I needed. My boyfriend absolutely loves it too, so I’m going to make some for him tomorrow. And happily my rosemary is doing very well at the moment! Phew! Thanks for sharing at Fiesta Friday! Thank you Anna! It is an easy bread to make. Just planting my rosemary and encouraging it to grow! Thank you for co-hosting FF this week! Wonderful recipe! I’m trying this on the weekend! Thanks so much for posting it! Thank you Linda! It is a keeper and easy to do. Please let me know how it comes out for you. This looks delicious Julie! I will be trying this soon. I know what you mean about baking at certain times. I always make a batch of scones when my husband is feeling under par – even though he is not that keen on scones! It makes me feel better though! Just popped over to The Daring Kitchen – how interesting! Your homemade bread making skills are on point! Looks amazing! It is an easy one that I would love to share with you! It great for dipping in a mix of olive oil and parmesan cheese! We have a great Italian family bakery here and I doubt I could beat their Focaccia even with your wonderful recipe. I just don’t have a great bake oven, but wish I did. I got a great oven about 7 years ago and wish I would have had it 20 years ago. It does make a difference. Thanks Debbie! Looks like your Chicago trip was a lot of fun! Hi Julie! the Focaccia looks lovely 🙂 so true about the preservatives, I bake breads at home, just the basic sandwich loaves and dinner rolls, trying to explore more of bread baking. Hi Freda! Thank you so much for stopping by. I am enjoying trying other breads too! WAS delicious :). And very tender. Thanks Lili! This is a gorgeous focaccia Julie 🙂 I’m imagining the wonderful smell in your home! You are so right. I love the smell of baking bread! I love focaccia so much!! I’ve never tried making it at home, but I totally should! Thanks for this recipe! Lisa it is such an unfussy bread to make and it’s perfect for dipping into good olive oil and parmesan. Thanks for stopping by! Our boys love bread don’t they? I hope you will give it a try. Yes they do, Julie. I certainly will try making it. Hope mine comes out as good as yours! Great texture with that crisp crust and soft center. I like the traditional version. Delicious! Sounds like an interesting blogging group. I enjoy it Liz. They have two categories, baking and cooking and it’s only once a month. You can read up on them. Thanks for stopping by! I’ve been looking for a good recipe! This looks great! Thank you Cynthia! Good and easy!! They looks simply wonderful Julie!!! You really achieved a gorgeous brown crust. I love focaccia and used to frequent a charming little cafe that served it sliced open with the most delicious ripe tomatoes and basil. Lovely post. That would be delicious and why I like this bread. It’s a great snack or side to a meal. It is very easy and delicious! Thank you for stopping by! That’s wonderful! It really is simple and you can make a couple and put one in the freezer. 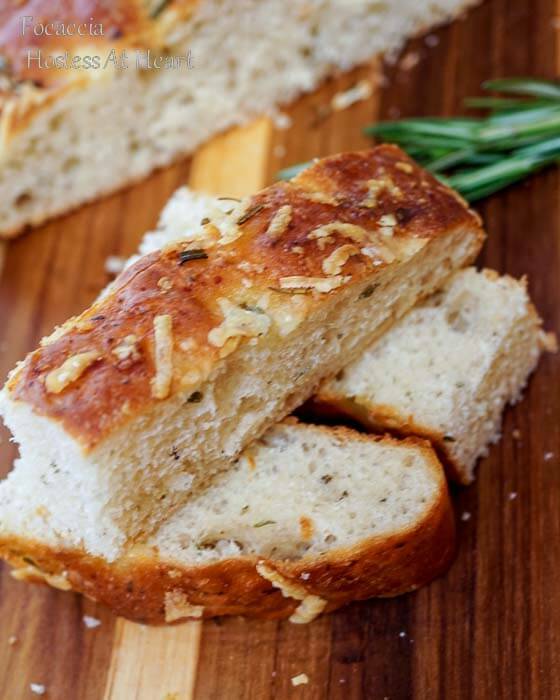 your focaccia looks so good! the recipe from the challenge was so tasty, i loved it! Thank you Juliana! Your focaccia came out beautifully too. They are quick and easy to do and I think the are popular in many countries. Thank you for commenting! This focaccia looks wonderful! I am inspired to try this recipe!